Can You Survive Without a Printer? | TonerGreen - Eco-Friendly Toners from the U.S.
Can You Survive Without a Printer? If you are always having troubles with your printer and it has already crossed your mind to actually dump it into your trash bin, you may want to ask yourself first if you can survive without a printer. This question may seem weird and if you are that cool enough you might even think that yes, you can. However, there are many things to consider before actually giving your answer. A printer was made to give life or rather print for functionality’s sake, materials that we want to have a copy of. But, it can be frustrating when you spend a lot for its printer cartridges and maintenance and repair kits, etc. 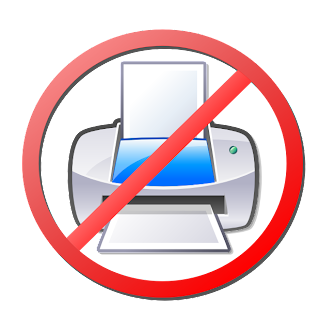 So when you don’t have a printer in the first place, you will never experience those irritating moments when error messages such as “Low on Ink” or “Paper Jam” appear on your screen. You can spend your money on other things rather than purchase expensive inks and toners; although there are already remanufactured toners and inkjet cartridges that can provide savings. The list of those blissful moments without a devastating printer can go on and on, but then again, are you sure you want to lose your printer? Losing this machine also subtracts some part of the fun for yourself. You cannot have those printed images to stick on your walls or display on your desk. You won’t be able to carry and read your files around since you do not have a printout of it. You will have to manually write everything since you do not want to print it. That’s total hassle for you, isn’t it? So the next time you see your printer doing those weird sounds or errors, have patience for it. After all, I think you cannot really survive without a printer unless you haven’t had one since you were born.